Our troop's slogan is "Troop 431 Does it All!" From outdoor activities, including camping, hiking, and high adventure, to advancement, trips, leadership opportunities, and community service projects, our program includes a variety of elements to suit the varied interests of young men from ages 11 to 18 in our community. Skill development and personal achievement are integrated into all the elements of our program. 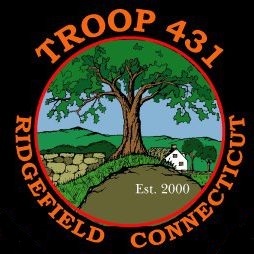 You can find out more about our troop and its program by exploring our website under "About Troop 431". The Troop meets weekly on Tuesday night from 7:15 to 8:45 at St. Stephen's North Hall at 351 Main Street. We follow the Ridgefield Public Schools calendar and generally do not meet if school is closed due to vacation or inclement weather. We encourage Scouts to pay for trips and activities using our online store. For your convenience, here are direct links to some commonly used items and to recent and upcoming trips.